That phrase reminds me of my Grandma - standing in her kitchen that was covered with yellow and brown sunflower wallpaper, hair twisted up with apron on, pulling cookie sheet after cookie sheet out of the oven and sipping a sweet tea. Oh, how much I loved her. And, her delicious food. This is a simple cut-out recipe - just a few ingredients - and things you probably already have on hand. The recipe calls for just the right amount of nutmeg - another eat with a cup of tea cookie. You can make these into any shapes you'd like, of course, and decorate them to your liking. 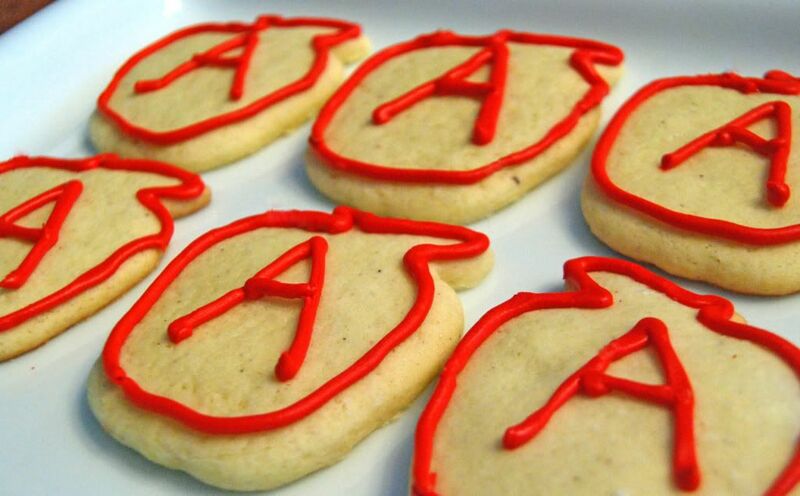 We made our tea cakes into apple shapes and decorated them with red icing and the letter "A". Now, lest you think I've got little prodigy pastry chefs on my hands, I decorated these. Red icing and my little guys is the perfect combination for household disaster. You should see the stains on their hands from just eating them. Our lesson: We are so thankful for our teachers - at MOPS and at church. They tell us all about Jesus! Beat butter at medium speed with an electric mixer until creamy; gradually add sugar, beating well. Add eggs, beating until blended. 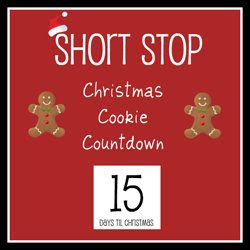 Combine flour, baking powder, and nutmeg; add to butter mixture alternately with milk, beginning and ending with flour mixture. Beat at low speed just until blended after each addition. Divide dough in half; cover with plastic wrap, and chill 1 hour. Roll half of dough to 1/4-inch thickness on a lightly floured surface. Cut with a 2 1/4-inch cookie cutter, and place on greased baking sheets. Repeat procedure with remaining half of dough. Bake at 350° for 8 minutes. Cool on wire racks. I'm sure they're very grateful for their mommy teacher this year!